I know what your thinking about this photo. What are those awkward tubular things with pale centers speckled with green. Are they giant croquettes? 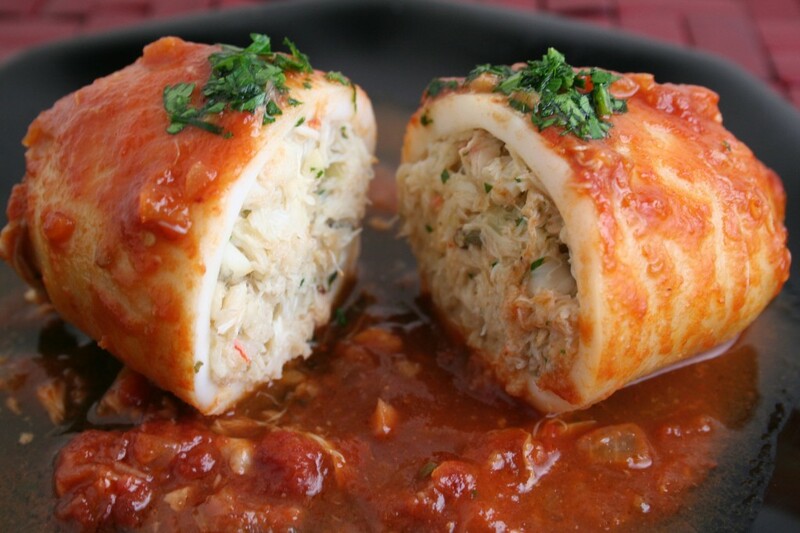 No…it’s a seafood delight: whole squid stuffed with a crab shrimp combination smothered in a tomato wine sauce. If you’re a seafood lover than this dish is for you. I made very few changes to this Italian based dish from “The Art of Good Cooking.” Primarily, I just eliminated the beef gravy because it’s often too time consuming to make and using a canned gravy with fresh seafood seems like a waste. As with all seafood, the two most important elements for success are: 1. To use the freshest seafood 2. Not to over cook any of it, especially the squid. If you manage these two tasks, you’ll end up with a soft buttery mix of lump crab meat and tender shrimp surrounded by light fresh squid with just the slightest bite. Save this one for a special occasion. Saute chopped onion and half of the minced garlic in half melted butter. When vegetables are soft, add chopped parsley, tarragon, shrimp, and crabmeat. Toss well together. Season well with salt and pepper. Stuff this filling firmly into the cleaned squid tubes. Heat remaining butter in saucepan. Add chopped scallions and remaining garlic. Saute till tender. Add tomato puree and wine. Bring to a boil and simmer for 5 minutes. Lower heat. 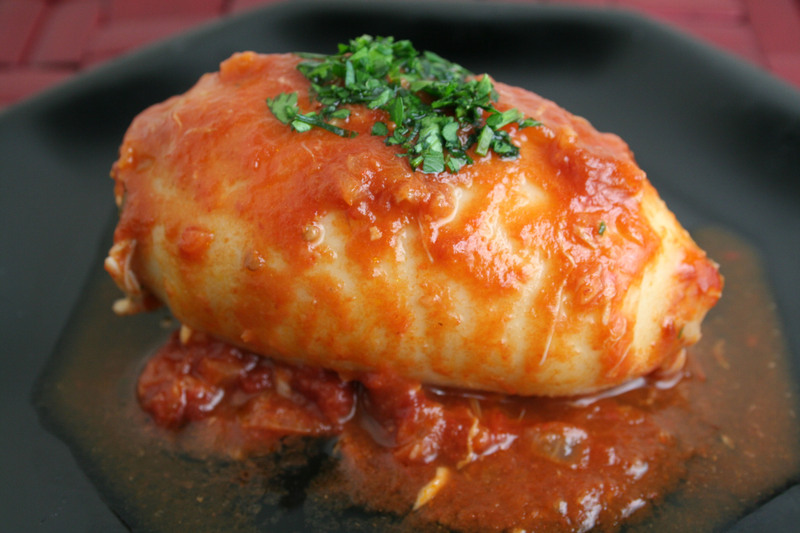 Add stuffed squid and simmer until squid are tender, about 20-30 minutes. Garnish with chopped parsley.